‣ Pesse MÜHSAM (FORMERLY PAPPENHEIM) (14 October 1776 - 28 January 1845) & Jacob SORAUER The descendants of Pesse and Jacob SORAUER (my ancestors) are found on the SORAUER page. ‣ Frommet MÜHSAM (FORMERLY PAPPENHEIM) & Benjamin BAGINSKY The descendants of Frommet and Benjamin BAGINSKY are found on the BAGINSKY page. Personal assistant to Albert Einstein. Siegfried Mühsam was a pharmacist in Lübeck, Germany, and the writer of “Geschichte des Namens Mühsam,” the history of the Mühsam family and the source of much of the information presented here. Eva and Theodor were first cousins; see Eva a few lines below. ‣ Erich Kurt MÜHSAM (6 April 1878, Berlin - 10 July 1934, Oranienburg concentration camp) & Kreszentia (Zenzl) ELFINGER (28 July 1884 - 10 March 1962) Erich Mühsam was a poet, writer, philosopher, and a leader of the anarchist movement in Germany. He was one of the leaders of the 1917 leftist revolution in Bavaria. He was murdered by the Nazis in 1934 at the Oranienburg concentration camp. See the MÜHSAM I page for a photo and more about him. Hildegard was a distant relative of Hans. She can also be found on THIS page. Eva and Theodor were first cousins; see Theodor a few lines above. Gunter Friedlander was one of the two founders of the pharmaceutical firm TEVA in Israel. TEVA is now the largest manufacturer of generic drugs in the world, and one of the 20 largest pharmaceutical companies overall. • Salomon PAPPENHEIM (2 February 1740 - March 4 or 5, 1814) The descendants of Salomon can be found HERE. If you are related to anyone on this page I would very much like to hear from you. You can contact me at geneo (at) theKesters.net or click on one of the email links to the right. A daughter of Pinkus Mühsam, Esther Mühsam, married Samuel Schweitzer. 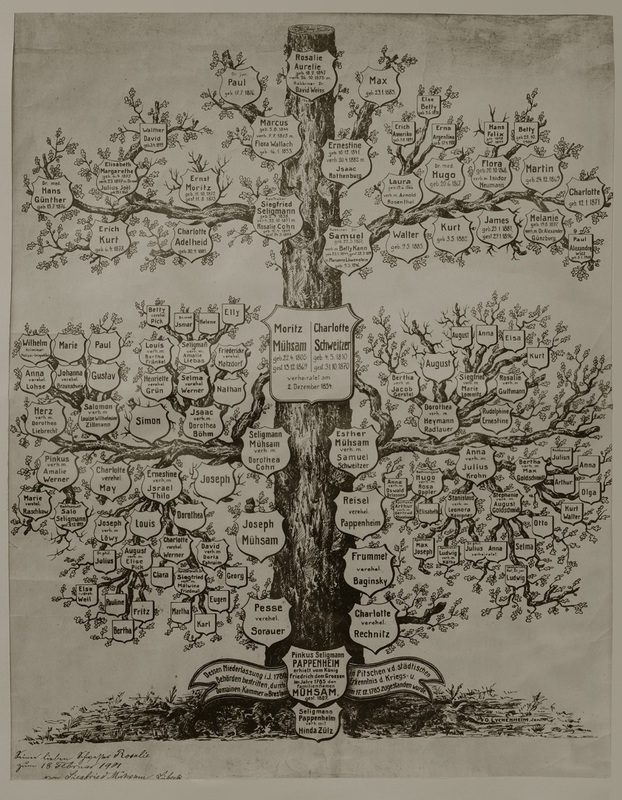 Their descendants are shown on this page, along with Esther’s immediate family. The descendants of Charlotte Schweitzer and her cousin Moritz Mühsam are also found on the MÜHSAM I page, along with more information about them, including about Erich Mühsam who was a famous poet and anarchist and one of the fomenters of the 1917 revolution in Bavaria. For an overview of the Mühsam and Pappenheim families, click HERE.